With the wide industrial experience, we offer the wide range of plastic processing machinery for our clients. 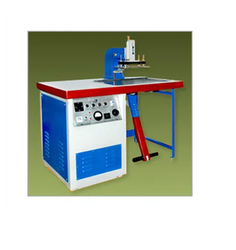 We offer H. F. Welding Machine for PVC and other materials.also use for Seat Cover Embossing, PU Jeans Laces Embossing, 3 Wheeler Rikshwa Windo Welding, Memberance welding. Looking for H. F. PVC Bunting flags Welding Machine ?